Pretty new touchscreen voting booths are nice, but if we truly want to get more people voting in this country, we have to make it much more convenient. A project that received funding from the Knight Foundation this week has a smart idea to digitize the absentee ballot and let people mail votes via smartphone. 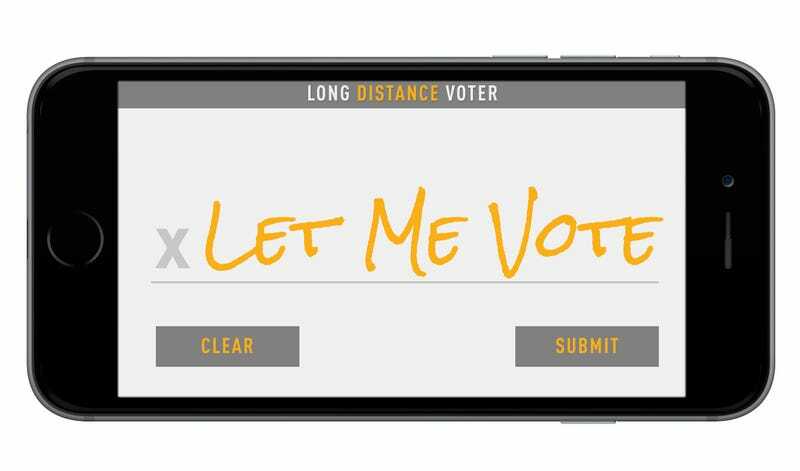 Vote By Smartphone is the idea of a group called Long Distance Voter, which has been working on ways to activate a group of US citizens with low turnout rates called the Rising American Electorate: millennials, unmarried women, and black and Latino voters. Citizens in this group are very likely to own smartphones: 85 percent of them currently do, claims Long Distance Voter. So it makes sense to focus on an election solution that takes advantage of smartphone ubiquity. But the real innovation here is not really a groundbreaking technology, rather, it’s a tech-savvy workaround to change to the way we do something that’s been around forever: Absentee voting. According to a report by Pew Charitable Trusts, more than a quarter of all ballots were cast by mail in 2014. In three states (Oregon, Washington and Colorado) voting by mail is actually the standard, and it has been proven that turnout has been higher because of it. But absentee voting still requires voters to fill out and mail a ballot, and in some places they must also print out the ballot themselves. It’s still cumbersome and wasteful, and people do make mistakes on paper ballots. What we need to do is fully digitize the process. Here’s how Vote By Smartphone would work. Voters would order an absentee ballot on their smartphone, which some states already allow as part of online voter registration. But they would also use the same system to vote right there on the phone, using an e-signature as an authentication system. Long Distance Voter plans to use DocuSign’s electronic signature technology, which is already used on other government documents. Voters would vote, sign, and mail their absentee ballots right from their phones. Long Distance Voter plans to prototype this paperless voting solution in two states—likely California and Missouri—for the 2016 elections, but there are some barriers to widespread adoption, namely the fact that every state has different election rules. Some states might allow you to register and request absentee ballots online already. Other states don’t allow vote-by-mail as an option at all unless you have an excuse for not getting to the polls. Will this improve turnout? It’s hard to say without seeing the actual process. Voting by mail is already pretty easy and that’s why so many people opt for it where it’s offered. It’s not very hard for me to vote by mail here in LA County at all, although I suppose that using my phone would make it easier. But are enough people familiar with DocuSign and the whole e-signature process to go paperless? I guess one thing I’d like to see as part of this is an awareness campaign around absentee voting in general and a push for all 50 states to allow that with no restrictions. People can take their time with the ballots and vote weeks early, which is a very good thing. But it also makes life easier for election officials—states that have made vote-by-mail the standard say that it saves them quite a bit of money. This seems like an obvious solution that will streamline the process even more. See all the Knight News Challenge winners here for more excellent voting innovation ideas.